When it comes to getting rid of cancer, the sharpest scalpel may be a proton beam. Technology conceived and hatched in highenergy physics is now treating thousands of patients per year, with fewer side effects. 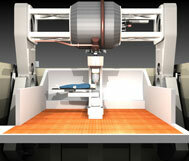 And research under way promises a new generation of smaller, cheaper, more effective proton therapy systems. Harold Phillips undergoing treatment for prostate cancer in one of the treatment rooms at Loma Linda Medical Center in Loma Linda, California. Forty years ago, doctors broke the news to the family of a small boy: Their five-year-old had cancer. Fortunately it was a type of cancer, called lymphocyte predominant Hodgkins disease, that responded well to radiation treatment. The doctors repeatedly beamed X-rays at the areas where cancer had infiltrated the boys lymph nodes—under his arms, on his neck, and in the middle of his chest—and the cancer went away. The boy was cured, but his health would never be the same. When he had a growth spurt at puberty, the irradiated parts of his body didnt grow as much or as fast as the rest. His neck was unnaturally skinny, his shoulders too narrow. Strange depressions appeared on his chest, like divots carved in a golf course green, where stem cells had been wiped out and muscles and other tissues failed to grow, says one of his physicians, Dr. Nancy Price Mendenhall, medical director of the University of Florida Proton Therapy Institute. The boys damaged thyroid gland no longer put out enough hormone; left untreated, this makes people fat and lethargic. He would have to take thyroid medication for the rest of his life. By age 34, his heart valves leaked so badly that they had to be replaced. Even today he has a higher-than-normal chance of having heart attacks and developing new cancers. While the bodies of growing children are especially vulnerable to the lifechanging side effects of radiation therapy—including lower IQ from treating the brain—it also leaves a dismal trail in adults, from rectal bleeding in the case of prostate cancer to serious lung inflammation from radiating the chest. The Loma Linda medical accelerator being built at Fermilab in 1989. Recent studies show that for every unit of radiation there is a certain amount of damage. Theres no threshold, Price Mendenhall says. Its just that the lower the dose, the longer it takes for injuries to show up. Thats why doctors didnt appreciate how serious the fallout from radiation treatment can be until five or six years ago. Even before radiotherapy became widespread, a young particle physicist named Robert Wilson came up with a better way—one that delivers more radiation to the tumor while sparing healthy tissue. Instead of using X-rays, he said, use protons. 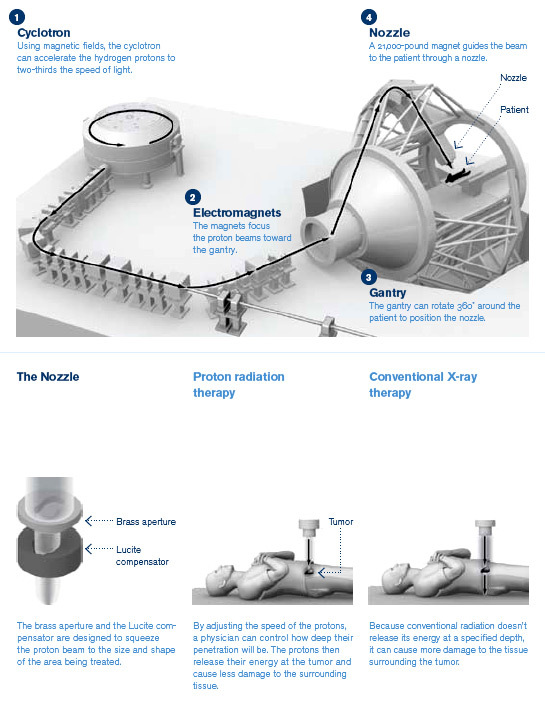 Soon a handful of physics labs were offering experimental proton therapy on the side. In the late 1980s, Fermi National Accelerator Laboratory in Illinois built a proton accelerator for Loma Linda University Medical Center in southern California, making it the first hospital in the world to offer proton treatment. Today, with five proton therapy centers operating in the United States and 26 world-wide, scientists are working on ways to make it cheaper, more compact, and more efficient. Proton therapy is a pure case of accelerator technology being used for the health of human beings, says Jay Flanz, an accelerator physicist and technical director of the Francis H. Burr Proton Therapy Center at Massachusetts General Hospital. Pete Freeman prepares for treatment for prostate cancer in a fixed-beam room at Loma Linda Medical Center in Loma Linda, California. Doctors have treated cancer with radiation for more than 100 years by implanting small pieces of radioactive material in tumors, for instance. But the invention of the linear accelerator ushered in a new age and has saved many thousands of lives. Originally developed to accelerate particles for physics experiments, linacs can also generate X-rays for zapping tumors. The first routine treatments with the new technology began in 1953 at Londons Hammersmith Hospital; the first in the United States took place three years later at the Stanford Department of Radiology. Today these machines are the work horses of radiotherapy. The technology has come a long way since. Doctors can now get a clear 3-D picture of the tumor with CT or MRI scans and shape the radiated area to fit the tumor, using advanced treatment-planning software. But collateral damage is still inevitable because most X-rays deposit their destructive energy in healthy tissue before they even get to the tumor, and some cause additional damage on the way out of the body. In a seminal 1946 paper called Radiological Use of Fast Protons, Robert Wilson, then based at Harvard University, laid out an alternative. Wilson noted that people had never considered using protons in medicine because these massive particles slow down when they hit the body and quickly stop. However, a new generation of accelerators would soon push protons to high enough energies to penetrate deep into the body and reach tumors that had been out of range. Whats more, protons lose energy at an increasing rate as they slow down. So they would deposit very little of that damaging energy going in and deliver most of their punch when they come to a stop inside the tumor. By changing the protons energy, doctors could get them to stop at any depth they chose. The first experimental proton treatments took place in 1954 at what is now Lawrence Berkeley National Laboratory. Wilson went on to build research synchrotrons that were also used for proton therapy at Harvard and at Cornell University, and in 1967 became the founding director of Fermilab. He had the vision of having proton therapy done in a hospital, where it would be available only for proton therapy treatment and could be done on a large scale, recalls Phil Livdahl, former deputy director of Fermilab. But it would take more than 40 years for Wilsons dream to be realized. He had already retired when a doctor at Loma Linda University Medical Center approached Fermilab for help. Dr. James Slater, who was in charge of radiation medicine at Loma Linda, had sent cancer patients to Lawrence Berkeley and Los Alamos national laboratories for experimental treatment with protons and other particles. Since research took priority at the labs, patients had to be fit in between experiments; sometimes they were turned away. So in the early 1980s Slater invited about 30 representatives of leading medical technology firms to a meeting. With $19.5 million in seed funding from the US Department of Energy, crews designed, built, and tested the machine at Fermilab, and broke it down into pieces for the move to Loma Linda. The new center treated its first patient in October 1990. As it turned out, Livdahl was diagnosed with prostate cancer just before the center opened and became one of its first patients. When the cancer recurred in 1996, he went back for a second round. Thinking back, it really gives you a great feeling knowing that something youve done in your career is saving the lives of people on a daily basis, says Livdahl, now 86 and living in Dallas. And the life he feels best about saving is his own. From top: Images of a patients skull show the area to be treated with protons; a patient is put into position; the treatment setup. Studies have shown the effectiveness of proton therapy, especially where theres an urgent need to spare healthy tissue—for instance, in treating children, the eye, the base of the skull, the prostate, and tumors very close to sensitive organs. Protons are especially good with large tumors that wrap around critical structures, Flanz says. But the technology does have its critics. The biggest drawback is the cost. Proton therapy centers are the size of a football field and cost in the neighborhood of $120 million to $180 million, including the building and all the associated medical equipment. On the other hand, hospitals no longer have to design treatment systems from scratch. They can buy ready-to-install systems from companies such as IBA, Siemens Medical Solutions, Hitachi, and Varian Medical Systems. Thats the approach the Northern Illinois Proton Treatment and Research Center is taking. Now under construction in West Chicago, it will buy treatment equipment from Varian. The $160 million, 130,000-square-foot center expects to open by early 2010 and, when its in full swing, treat up to 1500 patients per year. Skeptics say traditional radiation therapy has improved so much that in many cases its just as effective, and much cheaper. The high cost and reluctance of some insurance companies to pay mean some people just cant afford proton therapy, raising equity issues. Further, there havent been enough studies directly comparing the effectiveness of proton therapy to radiotherapy, chemotherapy, and other types of treatment. Supporters counter that proton therapy is so much more precise, and can be given in such big doses while sparing normal tissue, that it would be unethical to ask patients to undergo an inferior treatment so the two could be compared. Further, the economic comparisons are not as simple as theyve been made out to be, according to Price Mendenhall. Standard radiation treatment machines have to be replaced every seven or eight years, usually operate one shift a day and treat one patient at a time. Proton therapy equipment is built to last at least 30 years, operates two shifts a day and often feeds into three or more treatment rooms. This reduces replacement costs and allows proton centers to treat at least twice as many patients per year. And because proton therapy spares healthy tissue, doctors can give higher doses and increase the cure rate, Price Mendenhall says. This has also cut the length of prostate cancer treatment from 8.5 to 6.5 weeks, and doctors at Loma Linda think they can prune that to just four weeks. If they succeed, she says, proton treatment for prostate cancer will cost less than conventional X-rays. Then theres the much higher cost of treating side effects from radiation, she says, not to mention the cost of treating cancers that recur at higher rates than they would after proton treatment. Proton radiation therapy is potentially a better way to treat cancer because it has fewer side effects, but the technology is still very expensive. 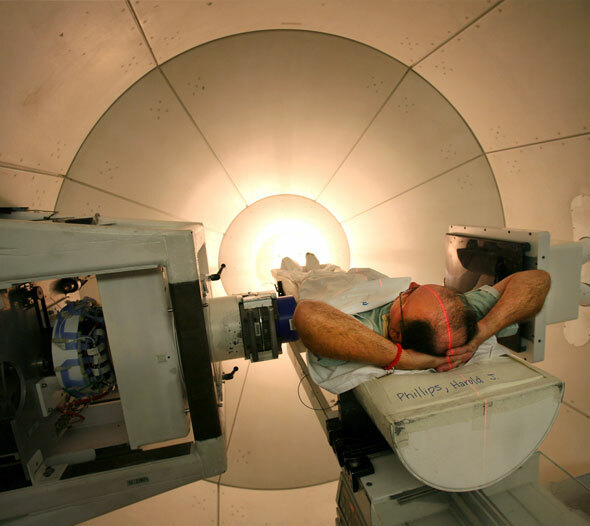 The University of Florida Proton Therapy Institute required eight years and $125 million to build, and it can serve up to 150 patients a day. For all the advantages proton therapy has, researchers think it could be a lot better. Cheaper, for one thing: The high price tag is the main reason more centers havent been built. A number of groups are hoping to cut the cost by delivering the same capabilities in smaller, lighter, simpler, more robust packages. 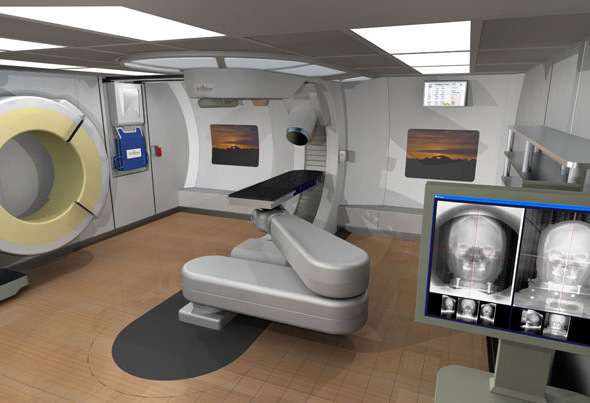 Artist renditions of proton therapy equipment being developed by Still River Systems thats small enough to fit into a treatment room. Still River Systems, for instance, is a small Massachusetts firm that is developing a proton therapy system that it says will weigh and cost one-tenth as much as todays technology. The approach was developed in partnership with the Massachusetts Institute of Technology Plasma Science and Fusion Center. 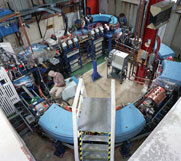 It uses superconducting magnets rather than conventional magnets to accelerate protons around a cyclotron. This allows the protons to make tighter turns and the cyclotron to shrink to the point that it can fit into a treatment room, at a cost of about $20 million per room. However, since most proton therapy centers have multiple treatment rooms, some experts say it is not clear how these costs will compare with those of current proton treatment. Although the technology is still waiting for US Food and Drug Administration approval, the company recently announced it will begin delivery of its first system in 2009 to Barnes-Jewish Hospital at Washington University Medical Center in St. Louis, Missouri. Another approach comes out of the US nuclear weapons testing program. Since theres a ban on testing the actual weapons, researchers use model bombs that contain only conventional explosives. (In a real bomb the job of the explosives is to compress and implode the nuclear inner core.) Scientists set off these dummy bombs in thick-walled buildings at Lawrence Livermore and Los Alamos national labs; and they use a particle accelerator to generate X-rays for documenting the implosions. While looking for ways to make this accelerator smaller and cheaper, scientists came up with the Dielectric Wall Accelerator. Its basically a tube for carrying a particle beam, explains George Caporaso, beam research program leader at Lawrence Livermore. Whats different about this beam tube is that the inner wall consists of alternating rings of electrical insulators and conductors. This allows the creation of a very strong electric field that permeates the inside of the tube; in principle it could boost protons to the energies needed for cancer treatment in just two meters. Thats a very enabling technology, Caporaso says. Theres nothing exotic about the material; its just the configuration thats novel. Pick your favorite insulator, and you can just slice and dice it and make this configuration. The technology is being developed by Compact Particle Accelerator Corp. in Madison, Wisconsin, a spinoff of the radiation therapy company TomoTherapy. Scientists at Brookhaven National Laboratory are looking for commercial partners to develop a technology they just patented. It has two advantages: By focusing the proton beam to a much finer point than todays machines, it would reduce collateral damage and allow most of the systems components, such as pipes and beams, to shrink as well, says physicist Stephen Peggs, one of the projects lead scientists. And it can deliver 60 pulses of protons per second, compared to one pulse every four seconds now. The result, he says, is a very sharp knife and a very flexible knife that should be simpler, more robust, and more reliable. Those are just a few of about a dozen projects aimed at cutting the cost, and in some cases increasing the effectiveness, of proton therapy. Meanwhile Loma Linda, true to James Slaters original vision, is undergoing a major upgrade that should increase the number of patients treated per day from 150-180 to more than 200, reducing the cost per treatment. Changing the energy of the proton beam, and thus how far it penetrates the body, used to take an hour; now its instantaneous. In 2009, Slater says, controllers will be able to do spot scanning—treating the deepest layer of the tumor, then the next deepest layer, and so on until the whole thing has been bombarded with protons. We can move them in any direction so we can paint in virtually any configuration the tumor is growing in, he says. And robotic systems will be in place to position patients for treatment. Loma Linda is developing a CT scanner that uses protons, rather than X-rays, to make detailed images of the area under treatment; this should reduce distortion and allow more precise placement of the beam. Its researchers are also investigating the biological effects of proton treatment on both cancerous and healthy cells. Some of these experiments use technology directly borrowed from high-energy physics, such as silicon microstrip detectors, calorimeters, and GEANT4 software for modeling the paths of particles through tissue, says Vladimir Bashkirov, who worked as an experimental particle physicist before joining Loma Linda 10 years ago. Flanz says he finds it interesting that all these advances—and many yet to come—are based on Robert Wilsons original idea, and on the foresight of administrators at Lawrence Berkeley and other national labs who made room for patients in their research halls.